Drake carried 12 times for 58 yards and one touchdown Thursday against the Texans. He also caught both targets for 37 yards and another touchdown in the 42-23 loss. Drake rushed for 72 yards and a touchdown on six carries and added 15 yards on four catches during Sunday's 32-21 loss to Detroit. Drake rushed 13 times for 57 yards while catching four of six targets for 21 yards and losing a fumble in Sunday's 31-28 overtime win over the Bears. 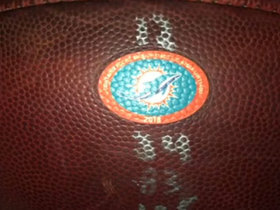 Analysis: Nobody will be more relieved than Drake that Miami pulled this one out, as his fumble occurred at Chicago's 1-yard line in overtime. As usual, he split work with Frank Gore, who rushed for 101 yards on 15 carries. The two running backs should continue to platoon against the vulnerable Lions run defense in Week 7. Drake may continue to see most of his involvement in the Miami offense as a pass catcher while Frank Gore handles more of the rushing duties, Armando Salguero of the Miami Herald reports. "Frank does a really good job of, 'We're second-and-five, third-and-two.' Or it's we're first down, second down, first down," coach Adam Gase said Thursday. "Kenyan is coming along in that area, it's just that he does give you that element of first-and-10, you get a 60-yard touchdown, where it's a game-changing play." Drake rushed six times for 46 yards and caught seven of 11 targets for 69 yards and a touchdown in Sunday's 27-17 loss to the Bengals. Analysis: Drake opened the scoring halfway through the second quarter with a 22-yard touchdown catch and was Miami's most productive receiving option across the board. The 24-year-old running back also looked explosive on the ground, but he got just six rushing attempts to Frank Gore's 13. Expect Gore to cut into Drake's production significantly once again when Miami hosts the Bears in Week 6. Drake played fewer snaps than Frank Gore in Sunday's 38-7 loss to the Patriots, Joe Schad of The Palm Beach Post reports. Drake carried five times for three yards and caught two passes for an additional seven yards during Sunday's 28-20 win over the Raiders. Drake rushed 11 times for 53 yards and a touchdown while catching all four of his targets for 17 yards in Sunday's 20-12 win over the Jets. Analysis: Drake opened the scoring with a six-yard touchdown run, and he topped out at 20 yards on his longest carry. Frank Gore once again cut into Drake's workload with 10 touches of his own, but Drake has been explosive enough to stay productive, despite ceding about 40 percent of the work to Gore through two weeks. Drake rushed 14 times for 48 yards and caught three of four targets for 18 yards in Sunday's 27-20, Week 1 win over the Titans. Analysis: Drake ultimately finished with 17 touches to Frank Gore's nine, but Gore made the most of his looks with 61 yards on the ground. Gore stealing more than a third of rushing work will definitely annoy Drake's owners, but the third-year running back out of Alabama still seems destined for enough touches to make use of his big-play ability. Drake and Frank Gore are listed as co-starters on the Dolphins' depth chart ahead of the team's Week 1 matchup with the Titans. Drake rushed four times for 32 yards and brought in one of two targets for 36 yards in the Dolphins' 27-10 preseason loss to the Ravens on Saturday. Drake and Frank Gore are both expected to have major roles in the Miami offense when the regular season begins, Armando Salguero of the Miami Herald reports. Drake rushed three times for 16 yards and secured his only target for seven yards in the Dolphins' 26-24 preseason loss to the Buccaneers on Thursday. 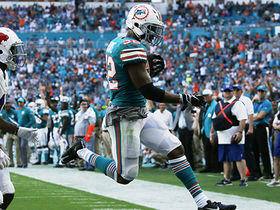 The Dolphins' posted depth chart lists Drake and Frank Gore as co-starters. Drake relayed Friday that he has added five or 10 pounds since the 2017 season ended, the Palm Beach Post reports. "So I'm about 215 right now," Drake noted. "I know as I run around I'll probably lose that weight. But maintaining it is definitely something I want to do. Get to that weight to begin with, sustain it during the offseason program. Then when training camp hits, I might lose five pounds, but I'll still be at an optimal weight for the season." Drake will be joined in the backfield by Frank Gore, who is signing a one-year contract with the Dolphins, Adam Beasley of The Miami Herald reports. Drake rushed 14 times for 75 yards and brought in all three of his targets for 15 yards in Sunday's 22-16 loss to the Bills. 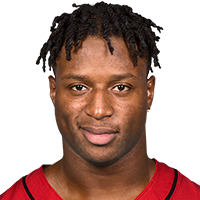 He was ultimately ejected from the game with 6:16 remaining in the fourth quarter due to his part in a fight following a Jarvis Landry one-yard touchdown. Drake rushed 13 times for 57 yards and failed to catch any of his three targets in Sunday's 29-13 loss to the Chiefs. Drake ran for 78 yards and a touchdown on 16 carries and added 35 yards on six catches during Sunday's 24-16 loss to Buffalo. 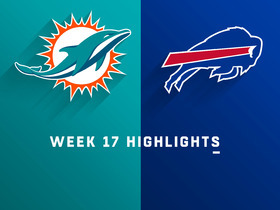 With Damien Williams (shoulder) listed as doubtful for Sunday's game against the Bills, Drake should see the bulk of the touches out of the Miami backfield, James Walker of ESPN.com reports. Drake rushed 25 times for 114 yards and caught five of six targets for 79 yards in Monday night's 27-20 win over the Patriots. Drake rushed 23 times for 120 yards and a touchdown while also hauling in three of five targets for 21 yards in Sunday's 35-9 win over the Broncos. 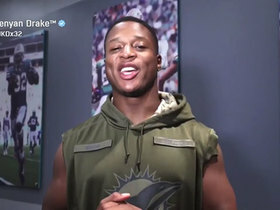 Drake is on track to handle the lead-back role for the Dolphins in Sunday's game against the Broncos with Damien Williams (shoulder) ruled out for the contest, Adam H. Beasley of the Miami Herald reports. 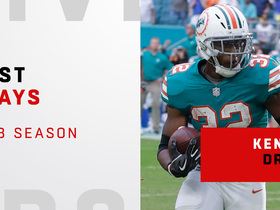 Drake figures to take on a larger workload Week 13 against the Broncos in the likely absence of Damien Williams (shoulder), James Walker of ESPN.com reports. Drake rushed nine times for 20 yards and brought in three of four targets for 27 yards and a touchdown in Sunday's 35-17 loss to the Patriots. He also lost a fumble. Drake only had four yards on seven carries and 10 yards on one reception as the Dolphins lost to Tampa Bay, 30-20, on Sunday. Analysis: Drake had been splitting the starting running back job with Damien Williams but disappointed fantasy owners with a poor performance Sunday. Part of the reason for his lack of touches could be that the Dolphins were trailing for most of the game, but more was expected of Drake coming off his 82 yards on the ground versus Carolina last Monday. 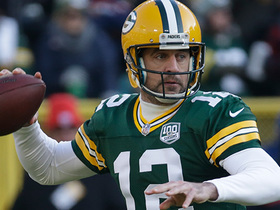 He'll now set his sights on Week 12's matchup with the Patriots. 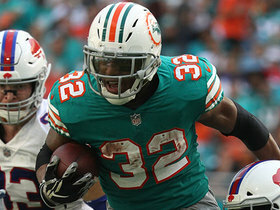 Dolphins offensive coordinator Clyde Christensen said Thursday that Drake is worthy of more carries, but suggested the running back isn't expected to encroach further into Damien Williams' workload, Barry Jackson of the Miami Herald reports. Drake rushed seven times for 82 yards and a touchdown in Monday night's 45-21 loss to the Panthers. He also caught both of his targets for 10 yards. Analysis: Drake's night was highlighted by a 66-yard touchdown run during the third quarter. 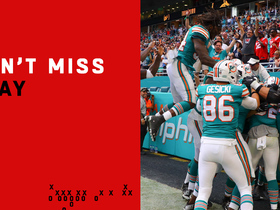 Although that marked Miami's best play of the game, and Drake's second rush of 40-plus yards in as many weeks, it came while the Dolphins were down 24 points. Nonetheless, considering Damien Williams only managed 19 yards on his nine carries, it seems Drake's big-play ability should see him spearhead the team's Week 11 rushing attack. 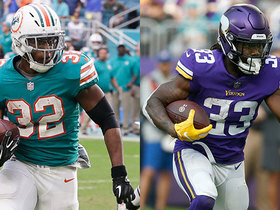 Head coach Adam Gase said Monday that the Dolphins will continue to employ a two-headed backfield of Drake and Damien Williams, James Walker of ESPN.com reports. 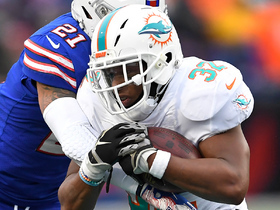 Following Tuesday's trade that sent Jay Ajayi to the Eagles, Drake and Damien Williams are in line to head the Miami backfield Sunday against the Raiders, Omar Kelly of the South Florida Sun-Sentinel reports.